The National Association for Civilian Oversight of Law Enforcement (NACOLE) is soliciting all civilian oversight entities in the United States to participate in the following survey in order to develop the first comprehensive directory of all oversight agencies and their characteristics.This dataset will be made available to the public for oversight practitioners, scholars, and academics to use for further advance the field of civilian oversight of law enforcement. The COAD will also be housed within NACOLE's Civilian Oversight Directory web application. 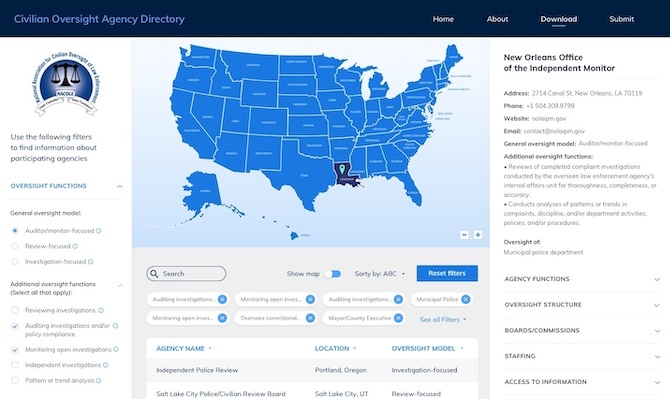 This application, developed with support from the Community Oriented Policing Services (COPS) office, will allow end users to search, filter, and compare oversight agencies across the country by various essential functions and characteristics. Once you begin the survey, you must complete it in its entirety in order for your oversight agency's information to be submitted. To make changes or corrections to your submission, please write to mike.vitoroulis@mac.com. This section captures some basic information about your oversight agency. For internal use. Will not be made public. This section asks about the structure of civilian oversight in your jurisdiction. Choose year that the most relevant and current enabling legislation was enacted/passed. Please provide most recent possible estimate. For agencies conducting oversight of multiple law enforcement agencies, provide the sum of all sworn personnel. Please provide most recent possible estimate. Please indicate the fiscal year for the oversight agency budget figure provided above. For agencies conducting oversight of multiple law enforcement agencies, provide the sum of all budgets. Who does your agency report to? Civilian oversight agencies are typically categorized as one of three oversight models: investigation-focused, auditor/monitor-focused, or review-focused. For more information about models of civilian oversight, please see NACOLE's report "Civilian Oversight of Law Enforcement: Assessing the Evidence". The report can be downloaded from NACOLE's website at http://www.nacole.org/reports_publications. Contemporary oversight agencies often utilize one general approach to oversight, and may take on additional oversight functions outside the traditional definition of their general approach.The first question asks how your agency would be primarily categorized. This is based off the functions your agency spends most of its time conducting. The second question asks whether or not your oversight agency conducts any additional oversight functions. Please select all that apply, including the option most similar to your selection in the first question. Auditor/monitor-focused. The office primarily conducts audits of completed department investigations and/or compliance with department policy and procedures OR actively monitors open department investigations and/or compliance with department policies and procedures. Review-focused. The office primarily reviews completed complaint investigations conducted by the overseen law enforcement agency's internal affairs unit for thoroughness, completeness, or accuracy. Investigation-focused. The office primarily conducts investigations of the overseen law enforcement agency separately and independently of the overseen agency's internal affairs unit. Reviews of completed complaint investigations conducted by the overseen law enforcement agency's internal affairs unit for thoroughness, completeness, or accuracy. Audits of completed department investigations and/or compliance with department policy and procedures. Active monitoring of open department investigations and/or compliance with department policies and procedures. Investigates civilian complaints separately and independently of the overseen agency's internal affairs unit. Conducts analyses of patterns or trends in complaints, discipline, and/or department activities, policies, and/or procedures. The following set of questions ask about staffing in your oversight agency. Staff titles vary across agencies, so please respond to each question with the position that best matches the functions and roles within your office. Some staff perform multiple roles within their oversight agency. If this is the case, one staff member can be counted more than once if their day-to-day duties span across multiple positions. The counts for paid staff in each position does not need to add up to the total number of paid staff response in the following question. Please approximate the number of paid staff in the following positions. Does your oversight agency have a mediation program? The following set of questions will be used to characterize the amount of information your oversight agency has access to in order to conduct its work. "Yes" responses indicate that your board and/or agency has reliable and consistent access to a particular set of information. This level of access is usually formally codified in either law or agreement with the overseen law enforcement agency. "No" responses indicate that your board and/or agency is not permitted to access a particular set of information. "Sometimes" responses indicate that your board and/or agency is permitted to access a particular set of information only at particular times during its work, and usually does not have reliable or consistent access to said information otherwise. If your agency is not allowed to publicly disclose the type of information it has access to, please use the "N/A" option. - A board/commission may only have access to the personnel file of an individual officer when deliberating and adjudicating a complaint. - Access to certain types of information is informal and relationship-based, i.e. not formally codified by law or agreement. Use the back/next buttons to preview responses before submitting.